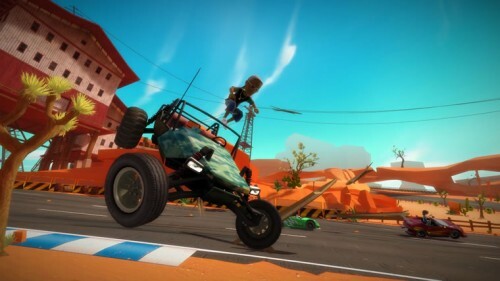 Joy Ride was initially intended to be a free XBLA game, but Microsoft decided to take that idea and scrap it as they made it one of the launch titles for Kinect. 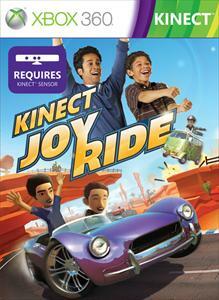 Kinect Joy Ride is now all about grabbing an imaginary steering wheel as you frantically try to take sharp turns and win against numerous computers by any means necessary in this Kart Racer. 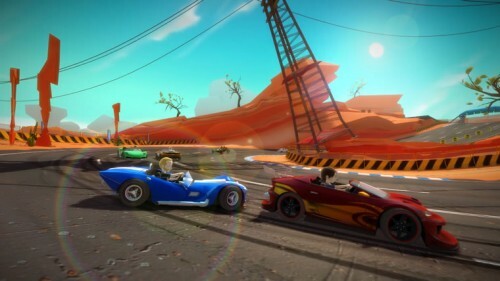 Kinect Joy Ride is a Kart Racer with multiple powerups, multiple modes, multiple levels, and a bunch of different cars. The developers did a good job by giving the player a large amount of unlockables to get through playing the game. As you progress through the game you will unlock more of everything, and the constant feeling of getting something new is nice; however, that feeling quickly ends and you are left with a game that eventually runs out of new and then you will be left wondering what to do next. With the unlockables, comes a large selection of cars; sadly these cars are purely aesthetic. They all handle exactly the same (as far as I could tell) and the only difference is their appearance. For kids the cars are nice; but for everyone else they don’t make a big difference, which hurts Kinect Joy Ride as a racing game. 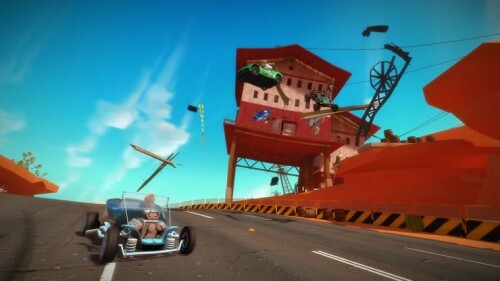 The rest of the unlockables include numerous tracks, each with unique layouts, jumps, and shortcuts. The multiple modes are nice too, with minigame type modes, straight up racing modes and then online as well so that you can compete with the world. Now we get to the actual driving part. As a racing game that requires you to actually drive, it is expected that driving would be enjoyable and stress free experience. This is not the case, because Kinect can’t pick up precision turns and quick reactions that are required in a racing game. All this is fine when playing against other human players who are just as bad as you, but against computers who make all those turns perfectly and the few people who actually sit down and play this game to perfect all these tracks will beat you every time if you don’t spend a whole bunch of time practicing and memorizing all of the courses. The boost mechanic as well as the stunt mechanic are extremely hard to pull off and aren’t consistent at all. Both of these making racing stressful as you frantically try to pull something off, and crash into a wall because you weren’t steering. The audio is nice and isn’t overpowering, but at some instances it feels out of place. You may be navigating a menu, when all of a sudden fast paced audio kicks in; which isn’t comfortable while changing settings in a menu or picking a level, it makes you feel rushed. The rest of the audio is just there for the sake of being there, there isn’t much more to say about it. The graphics are nice and the integration of your Xbox Live avatar helps to put the player into the game. The graphics fit the game’s style and your avatar seems to fit right in. The graphics are designed around your avatar so that they are both in unison and everything around you seems like one solid game; rather than the avatar sticking out like a sore thumb, which is the case in many games. There are a few achievements that are unique and fun to get, but these are quickly cast aside for the big boys that are simply annoying. Achievements such as beating this 30 times, or doing that 30 times are simply too much and ruin any fun there is at trying to get the achievements. Half of the list is fun, the other half is just plain time consuming, and if you actually spend that much time going for all of them; then you have way too much time on your hands and no other better games. Getting an achievement which requires you to play a total of 10 hours is simply asking too much. The concept of Kinect Joy Ride may initially be fun, but grabbing an imaginary steering wheel and rotating your body for flips isn’t actually that fun in the long run. The controls are not responsive and the entire driving experience is not that enjoyable. However, the game has a bunch of modes and quite a hefty amount of unlockables that creates some enjoyment; the game is also accessible to a large audience which lets little kids pick it up and play without much hassle. As a driving game, the concept is there but the implementation of the Kinect is not precise enough to be a fun Kart Racer and boosting is a nightmare. 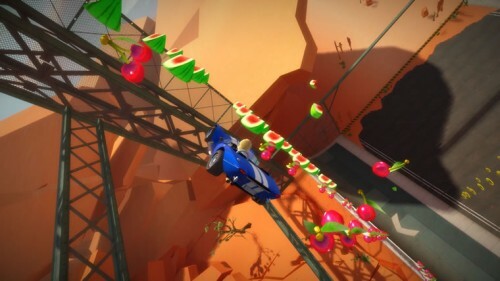 Kinect Joy Ride has its moments, but they are too far between for an enjoyable experience and you just can’t have a racer where you can’t steer properly.